Does anyone know why there are two relays, K1 and K7, in parallel in the VOLTS HI INPUT? Why are the above needed anyway given that the signal can also be isolated by turning off K2,K3,K4,K5,K6 and K9? Under what circumstances does it need to disconnect the input terminal? Also what is the pupose of the series/parallel set of jumpers JM201 to JM207 shown on the bottom right of the SENTRY CURRENT SHUNTS diagram? Ooops - forgot to attach the pictures! To decrease/halve the effects of contact resistance? That's easy. When you see funny stuff like that on a schematic it is worthwhile looking at the actual PCB and you will find the reason! 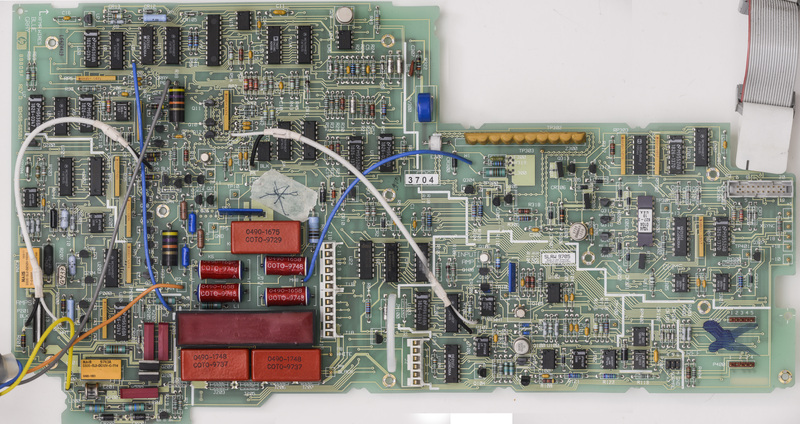 The 3458A is an old school double sided PCB design. Sometimes you need to route over/under some tracks and it's not physically possible without some bodge. In the old days we used wire link "JUMPERS". Nowadays we use 0 ohm surface mount resistors which a pick and place can deal with much easier than a through hole jumper. Now the parallel relays... I'm not so sure? You could say contacts resistance or high currents, but that doesn't explain why they are individually controlled. ETA: Some of those ground jumpers look close to test points also, so a convenient place to hook your 'scope probes. The good old days when easy service was engineered into a product! Ah yes - pretty obvious now you point it out - thanks. Not sure why they are included in the schematic though other than those that are explicitly required for test purposes. This is a high impedance input - 10Mohms minimum and in any case the signal also goes through another relay contact, K2-K6 or K9 which aren't doubled up. And why are either of them there given that K2-K6 and K9 can also disconnect the signal? Actually I am looking at TiN's excellent hi res photo of the A1 PCB and my explanation doesn't add up in this case. Bottom of the picture, J201 is what I would expect of a normal jumper, but the others J202+ clearly serve another purpose. I'm guessing its for counteracting leakage, but there is definitely some total grey beard wizardry there. Doh! Just realised that both ends of the links connect to ground so clearly not for pcb layout reasons! Very odd. One possible reason for the parallel relays could be the use for 2-wire ohms measurement. Individually switched one might be able to compensate for the resistance. Having thought about it a bit more, my guess is that K1 (COTO 3500-0043) is probably a low thermal EMF reed relay and K7 is used to protect K1's 'delicate' contacts should the maximum input volatge, 1000V, be connected to the input terminals. K7 would only be switched on to short out K1's contact when K1 is opened or closed after which K7 would be opened again. This would ensure that K1's contacts would not have to break or connect at high voltage - although it is a high impedance circuit it could have 10's or even 100s of pF of capacitance and, switching in 1kV could conceivably cause arcing and damage to the contacts. K7 is a different type of reed relay, COTO 5000-0124, probably with beefier contacts. In any case K7's contacts would never be closed during measurement so damage to it's contact would be irrelevant as would its larger thermal EMFs. It would also explain why K2-K6 and K9 aren't sufficient, as all of those would need to be similarly protected if K1 wasn't provided. Yes, that's exactly it. There's a reference I've read, somewhere in the rather scattered 3458 documentation, to a "special sequence" used to protect the input relays. The 3458 can self calibrate just from it's internal voltage reference and a very stable 40K resistor (part of the current shunts) and to do this it needs to be able to switch the input circuitry around in interesting ways including using an external low thermal emf dead short across the input terminals. Thus it needs to be able to disconnect the input sockets from the internal measurement 'bus' so that's why there's a relay there in the first place. These COTO relays probably are custom specific, as this family still exists, but not with these part numbers. In the 3458A-BOM, K1 and K3 are designated as 1µV relays, K4 is a 5µV relays, i.e. these are low e.m.f. relays, but have about 200V switching / breaking capacity only, if you compare the actual 3500 family datasheet, type 3501. Therefore, K7 is probably capable of switching > 1000V, and so to protect K1. It's COTO 5000-0124, probably a custom specific part. So K7 is used to protect switching of K1, and for the 100V / 1kV range via K4. Have a closer look at the switching of the low e.m.f relays K1, K3 and K4. These are probably nominal 12V types, and turn on at 9V already, following the actual datasheet. All three are switched on by Q1 /CR1 with about 10V, but CR7 provides another ~4.5V hold level. This dual level provides power reduction (to 25%) to further reduce e.m.f. generation. Both relays were controlled by dual FF U22, under normal conditions by the CPU. In case of overvoltage on DCV, over R17/R19 at greater an input voltage than +/-14V, OpAmp U10A will quickly HW-reset K1 and K7. R17 and R19 are 10k in total only, so 1000V overvoltage gives 100W, which must be switched off within < msecs. Other DMMs, like the 34401A / 410A/ 411A have instead 8 x 13k, 1W resistors, which gives 10W in total only, under full overload conditions, which may be applied nearly indefinitely. The 3458A needs this low ohm input resistance, due to its fast DCV input path. Thanks Dr.Frank for good details. May I include this information (with reference ofc) into my worklog? I also had chance to take a look on high voltage option of 3458 (1000VAC) but did not see any visible parts difference on either A1 or A11(F/R switch protection PCBA). I'll have pics posted later. Sure, with compliments.. it's published on EEVBLOG for free usage. The 1000Vac maybe designed into the AC board, as the input switching obviously can withstand up to 3500V already. I assume, that the 1MOhm input resistance of the AC circuit had been increased, or the input attenuator resistors are 2W types, and the input protection of the AC circuitry is made stronger. Well, assembly level manual states only A11 board is different in HV option meter, if my memory works right. An operation that is not always necessary but takes considerable time during a range or function change is a special sequence of relay closures in the front-end circuitry. This sequence protects the relays from damage when high voltage is on the input terminals during range changes, but is not needed when measuring low voltages or if high voltage is only present when the instrument is set to a high voltage range. Therefore, the HP 3458A provides an HP-IB programmable command to defeat the protection scheme, speeding up the relay sequence by a factor of five. If an overvoltage condition occurs while protection is inactive, an interrupt is generated and the relay sequence is reversed, thereby protecting the relays from damage. A delay of 0.4 second is then inserted to prevent a rapid recurrence of the over load condition, and the instrument reverts to normal (pro tective) relay sequencing thereafter. From the user guide the command is DEFEAT [ON|OFF]. But if you do turn the protection off and an over-voltage is detected, it gets recorded and may be used as evidence against you in the event of a warranty claim! FWIW I calculate that the over-voltage detection (U10A) levels are approximately +117V and -107V - but I might have got my sums wrong. So that just leaves the mystery of the jumpers JM201 to 207. There is a counter in the CalRam labelled "Destructive Overloads". Looking at the PCB it just looks like the jumpers are replacing 'do not fit' component positions that had been provisioned on the PCB but weren't needed. It might have been a protection or compensation network that they though they needed or might have needed but then found or decided that they didn't. Notably, one end of that chain starts at the input protection components for the current measurement section so I'd err towards a abandoned protection scheme. Your things that snitch on you.